People are surprised when I tell them I’m interested in citation management software (I’m talking about librarians here; non-librarians just stare blankly when I tell them that). Am I really that passionate about these programs? Yes; I have a special fondness for Zotero, but I’ve also learned to love EndNote (in spite of its many quirks) through teaching it for the past couple of years, and I’ve been curious enough to spend time with RefWorks and Mendeley as well. So do I really love citations that much? No. In fact, just the opposite. I have no love for the mechanics of the various citation styles, and I think it’s a waste of time for students and researchers to go through their reference lists and italicize the journal title and volume number but not the issue number (when using APA style). I think it’s a tragedy when a student (especially an undergraduate student) loses marks on an assignment for putting a comma after the journal title instead of a period. I love citation software because I don’t love doing citations by hand, and these programs can save people a lot of time and frustration by automatically formatting citations in just about any style imaginable. Now don’t get me wrong, I think it’s essential that students are taught the principles behind citing; they absolutely need to learn why and when to cite. I just don’t think they should spend so much time on how to cite. I suppose it’s worthwhile to teach students that different citations styles exist, but even this isn’t critical for students who have no intention of ever publishing an academic paper (though they do need to know the name of the style they’re expected to use, so they can select it in the software). I would actually go so far as to say that the use of citation software can discourage plagiarism in some cases. Imagine a first year undergrad working madly late at night on a paper that’s due the next day (I’m sure you’ve never known anyone like this, but use your imagination). He comes to the end of his writing and realizes he needs to cite his sources. He types up citations for all the direct quotations and other obvious passages. Struggling to keep his eyes open, he realizes there are additional sources he relied on heavily in his research, but he can’t quite remember where he copied down their details. Plus, he’s so tired that he will probably make errors in his reference list and lose marks. He hits print and falls asleep at his desk, without giving any credit to some of his sources. Now imagine that same student, still working at the last minute, but this time he’s been using Zotero (or a similar program) throughout his research process. Each time he reads something relevant, he adds the citation information to his Zotero library (usually with just a single click). Now when it comes time to insert these citations into his paper in the wee hours of the morning, he makes a few quick clicks, and the word processor plugin does all the work for him. Of course, he needs to go through and make sure there are no errors (the software is certainly not perfect), but it saves him a lot of time and effort. And since it’s quick and easy, he cites all his sources, even the ones he might have been able to get away with omitting. When first learning about citations, students often ask how to decide how many to include in their papers, to which most instructors reply, “when in doubt, cite.” I’m sure this occasionally leads to papers where every single sentence has a citation, but I think everyone would agree that it’s better to have a few superfluous citations than to have a few omitted. I say, let’s make this as easy as possible by using software for the heavy lifting. So I love citation software because I don’t love forcing students to learn where to place their commas when they could be learning how to actually perform research. But this leads to another question: what would happen if every university instructor in the world agreed that students could just jot down the author, title, and publication year of each source they used, in any format? Would I still love citation software if its formatting function became unnecessary for undergraduates? I’ll admit this would make it less essential, but I think it would still be useful to help students keep track of their sources as they go through the research process. And of course the formatting function would still save time for graduate students and other researchers. So yes. I would continue to promote these programs to students, learn new ones as they are introduced, and blog about them. What do you think? Am I crazy for loving software this much? Leave me a comment! I recently attended the Ontario Library Association Super Conference, where I chatted with a ton of interesting people, including a group of student volunteers. One of these students later emailed me with a question I hadn’t put much thought into before: what types of technology should students (and new librarians) become familiar with? After sending her a list of suggestions, I decided I should share my thoughts on here as well. All the tools I’m mentioning are free (with a couple of exceptions I’ll point out) and easy to learn. Doodle: This is an easy-to-use tool for scheduling meetings. I’ve used it numerous times in my professional work, usually for arranging committee meetings. Skype: Great for conference calls (especially if you want to avoid paying for long distance). I’ve used this at work as well. PBworks: I would definitely recommend that everyone learn how to create and edit a wiki, and PBworks is an excellent free tool. I’ve used it at work for sharing information with colleagues. A good real life example is the Library Day in the Life Project wiki. Dropbox: I love being able to sync my folder and access files from my home computer, work computer, and iPad, plus anywhere with an internet connection through the web interface. Amanda says she even used the sharing function to collaborate with her co-author and editor when writing a book. I use it to keep track of my professional development and job applications. Evernote: I’ve only been using Evernote for a little while now, but I can’t remember how I ever organized my life without it. It’s especially useful if you have a smartphone or tablet, but I think it’s still valuable even if you’re just using the desktop version. David says he has used it for house hunting (to keep track of realtor websites, info from his lawyer, photos of the houses, etc.) and at the bookstore when he sees a book he wants to remember to borrow from the library (he just takes a photo of the cover, and then can search by title or author later). The search function is excellent, even for text from images. Google Docs: As Charlotte points out, Google Docs is all about sharing, even more so than Dropbox. If you want to be wowed, I would suggest you try the following: create a document, share it with someone, and then have that person start editing it on another computer, and you’ll be able to watch them make edits in real time. If you’ve ever collaborated with someone and ended up with a folder full of different versions of the same document (and perhaps even lost track of which is the newest version), you will love Google Docs. Blogs: At the very least, you should be reading blogs on a regular basis (but I suppose I’m preaching to the choir by saying this on my blog). And if you’re reading blogs on a regular basis, you should set up an RSS feed reader – I love Google Reader, but there are plenty of good options available, either web-based or desktop-based. I’ve mentioned this many times before, but I would encourage all students (and professionals) to go one step further and start their own blog – it’s easy to do with a platform like WordPress or Blogger. Here’s an article I wrote as a student, explaining why students should blog: Why You Should Blog. LinkedIn: As a future or current professional, you absolutely must have a profile on LinkedIn. When potential employers Google your name, you want them to find this and not your embarrassing Facebook photos. It also helps you keep in touch with classmates, colleagues, and people you’ll meet at conferences. Social bookmarking: If you’re still saving all of your bookmarks in your browser, you should really consider a web-based option. The most popular site used to be Delicious, but they made some changes I didn’t like, so I’ve moved to Diigo. Once you’ve set up an account, try installing an extension for your browser to make it even easier to save sites for later. Presentation software: The standard is PowerPoint (not free, but probably available at your school or work), so you’ll need to know how to use it well, especially when you’re collaborating. You don’t need to know about all the advanced functions, but you should be able to quickly create a simple, attractive presentation. In a pinch, you can open PowerPoint slides in OpenOffice.org (which is free), but a lot of the formatting will be lost, so I don’t recommend it as a long-term solution. A much more attractive free option is Prezi, which allows you to easily create visually interesting presentations. Edit: @adr points out that “Prezi is not indexable, not searchable, not plain text, and makes people seasick.” However, I like the fact that presentations are posted publicly online by default (even if they’re not indexable). Whether they make people seasick depends on how you create your transitions. Citation management software: You should learn at least one of these programs. 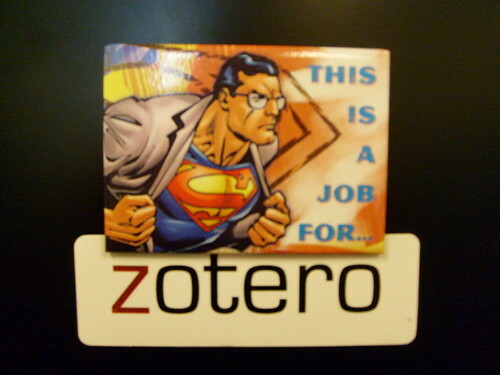 If your school or library gives you access to RefWorks or EndNote, go ahead and start there, but you should also check out Zotero, which is free, open source, and easy to learn. Make sure you learn how to get citations into your library, and then how to use the word processor plugin to automatically format a paper. Another popular free option is Mendeley, which has an integrated social network for researchers. Screencasting software: This isn’t essential, but it’s sort of fun. Check to see whether your school or library gives you access to Camtasia or Adobe Captivate – if not, try Jing, which is a free alternative. What else would you add to this list? Leave more suggestions in the comments.